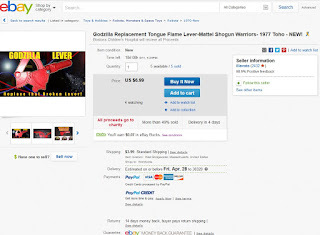 Recently there have been several ads on eBay regarding the repair of the Godzilla Lever - the red stick protruding from the back of the Mattel Godzilla's head that projects the "tongue" of flame. The first Godzilla I ever owned, purchased at an estate sale back in the 90's for $20, had a broken lever - there was just enough to friction-grab with a finger to make the flame but still, a defect. Since then I've owned about a half dozen Godzillas will broken levers - currently I have three. 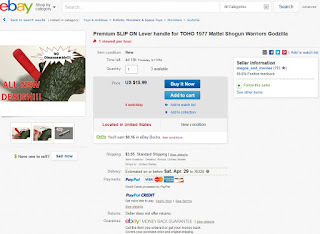 Initially I thought about buying one each of those offered on eBay (only two at the time - since then a third option has been offered) but settled on the one offered by Derik Larson of Shogun Plastics. I've purchased from Derik before - his missile replacements are the best you can buy, in my opinion and an improvement over those offered by Popy and later Mattel. ***Premium Replacement lever to install in your flaming tongue mechanism! Never before offered until me!! Original Design; not a recast!! 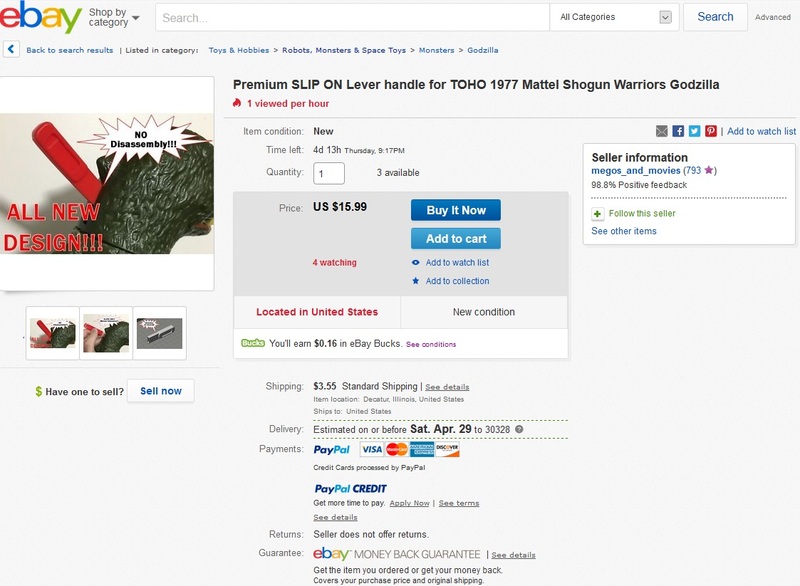 If you’re here looking, then you already know you need this premium manufactured part for your Vintage 1977 TOHO Godzilla. This part was meticulously designed in CAD software (not an undersized recast) and 3d printed. For the purists of the hobby, to prevent fraud, the part does not look exactly as the original; but it functions exactly the same and is much stronger. I have received great praise from my part regarding all aspects. Plus, because it is not a shrunken recast, mine fits proper without modification because its tolerance is true. Don't be fooled by a exact reproduction recast - it is smaller than the original. This sale is ONLY for the replacement lever as seen in the photo with the tape measure. The flame assembly and Godzilla are only photographed to illustrate what it looks like installed. Feel free to ask any questions. I will assist the best I can if you need help installing. *Note - The response to this part has been greatly appreciated. 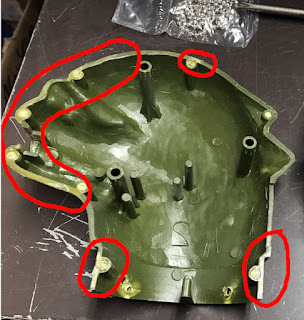 If you have a 1st Gen head with the three visible plug holes on his leftside, the head will need separated differently than a 2nd Gen head and is more challenging. I also offer installation service, at additional cost, if you require it. Just look at my other eBay items for sale. It goes without saying, if you buy this part, please be advised some novice mechanical abilities may be required. To ensure 100% satisfaction, I would ask you open your head before buying one of my parts - that way when you receive your purchase, all you have to do is assemble and Play! This is an interesting design - looks to have been a CAD copy of the original with an extended lever 3D printed. In my mind a bit clunky but functional - it's also the first attempt to fix a common problem, so kudos to the seller. There's a bit in the ad that's misleading "Don't be fooled by a exact reproduction recast - it is smaller than the original." - I believe this was added once the second version (Ad #2 below) was released by a competitor - more info in my notes below. Exact Replica of the original lever! Looks just like the original and works just like the original. Lever is the thicker reinforced version from the 3rd version. Lever still fits all versions. Cast from the original lever! Look at the pictures and judge for yourself. Get the Lever with the Rich deep color of the original. 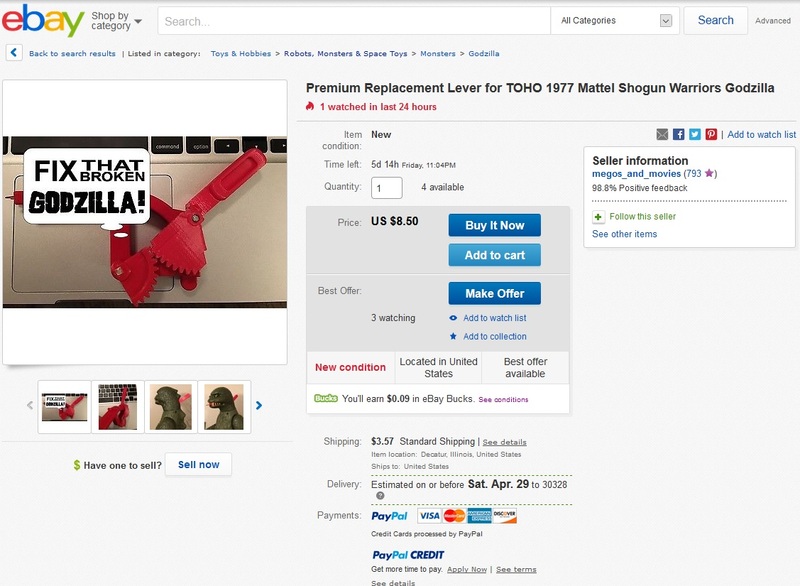 As indicated in the first ad, this is indeed a recast of the original lever, using the reinforced design from the later version Godzilla (it has the side bits that make it harder to break). I compared this to the original lever and it's almost imperceptibly smaller (it's common for recast parts to be slightly smaller due to shrinkage, especially when using inferior materials - however this lever is made from premium plastic and has almost no shrinkage - about the thickness of a piece of paper or from a digital gauge, about 50 microns). The plastic approximates the original PVC but is made from more of a nylon material that should improve the durability even more than the reinforcements - it's not like most collectors will be playing with Godzilla in the backyard where he can be dropped - I think that's how most levers were broken, during rough play). The color is quite a good match also. ***Premium all NEW DESIGN, SLIP ON lever handle to install on your flaming tongue mechanism! Never before offered by any other seller!! Original Design, NO head disassembly required!! 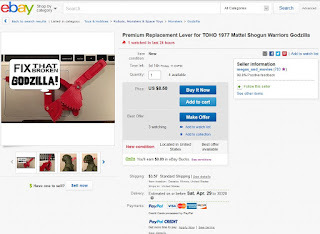 If you’re here looking, then you already know you need this premium manufactured part for your Vintage 1977 TOHO Godzilla. This part was meticulously designed in CAD software Don't be fooled by an exact Lever reproduction recast - it is smaller than the original. This sale is ONLY for the replacement SLIP ON lever. handle. This lever handle has been installed on Gen1 and Gen2 heads successfully, without any disassembly of the head!! There will be rare cases where the internal gear of the flame mechanism moved when initially broken years ago and that would prevent proper application.. Please make sure before buying my lever that your broken flame mech lever is in the top position. The SLIP ON lever handle has a very tight tolerance, yet easy installation. In rare cases of Gen1 heads, the tollerance may be snug and when combined with a weak flame mech spring, the lever will install, but the return action of the lever will be reduced. For best results, pull the tongue out a little; this will move the broken lever into a better position and allow you to slide the handle down over the broken lever stem. This item is intended to let you work the flame action, but not abuse it. The tolerance is within microns and does not require any adhesive. This is an intriguing design as it allows for a fix without taking the head apart. More on that in a bit. I'm not sure if you need to use a bit of glue or if the friction fit is enough. I think this is a better design than the seller's original offering as it provides an alternative to get the toy working and it foregoes taking the head off and apart. 1. 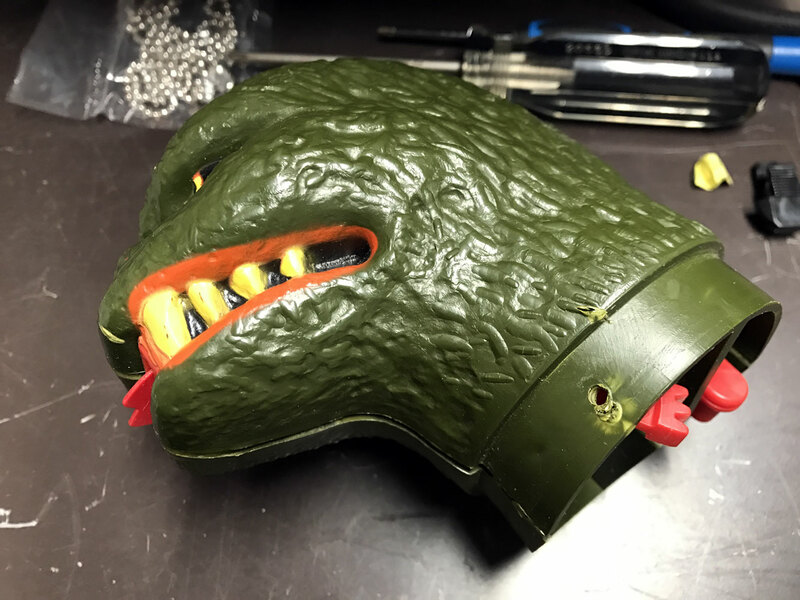 Remove Godzilla's head - this is the simplest as it requires the removal of the four screws. 2. Separate the head's two halves - there are two different versions of the head - the earliest has plugs hiding screws - the hardest part is removing the plugs without damaging them. Head with plugs: You will went to use a small metal probe or a micro flat-bit screw driver - in either case you may need to nudge the side of the plug with the tip of an X-acto blade. Once removed the head is easy to separate. Glued Head: The later heads were glued together - you will want to gently scribe the surfaces to loosen the two halves so the plastic doesn't break - I use the tip of a new X-acto blade, running over the seam until I feel it separate. Be careful not to slip and damage the surface (or cut yourself!). Most of the glue is around the mouth and neck joints. Once it's loose all the way around you can pull the head apart - the pins are glued so they will break but you'll re-glue them when you put it back together. If they are stubborn you may need to use something to pry to head apart or cut apart the pins at the joint line from inside the head. 3. Remove the Mechanism - the mechanism just lifts out - take a photo so you can get it back in the same place. 4. Remove the lever - I first tried probing it with a micro-screwdriver and don't recommend this - the pin holding the lever into the assembly is knurled and you won't have much success this way - you can probably pry the lever off with a pair of pliers but you could damage the assembly. Better to use a 5/32" punch which fits the pin exactly. Make sure you have something sturdy supporting the two halves (I used a slightly opened vise in my shop). Don't have a punch? You can use a small nail (cut off the point). 5. Replace lever - make sure that the gears and the hole for the pin align and press it in. If it fits too loosely you may want to put a dab of epoxy in the lever hole. Make sure you do a test that the mechanism works before putting the head back together. 6. Put head back together - align everything up and test fit. Once you're happy you can add a few dabs of super glue and use a couple of rubber bands as clamps. 7. Replace head - the head screws back in much the way it came out. Put the screws in half way before tightening - you want to reuse the same holes in the head and body.